In the bowl of a stand mixer, combine flour, baking soda, cinnamon, salt and sugar. In a separate, medium bowl, whisk together egg, brown sugar, applesauce and blueberries. Add wet ingredients in three batches to dry ingredients and mix until just combined. In a separate bowl, whisk briskly cream cheese, vanilla extract and powdered sugar (use an electric hand mixer if you have one). Fill a 12-cup muffin tin with baking cups. Fill each 1/3 of the way with the batter. Place a dollop of the cream cheese mixture in the center. Fill the cups with the rest of the batter. Bake about 30 minutes, or until muffins are a light golden brown and a toothpick inserted in the center is free of batter (it may have blueberry or cream cheese residue on it -- that's OK). Allow muffins to cool about 15 minutes before serving. I’ll be honest – I’m not much of a fan of the “low-fat” food fad. To me, it seems healthier to eat full fat foods, but in smaller quantities. However, low-fat foods aren’t necessarily bad, as long as they’re made with real ingredients. None of that fake stuff goes into anything I bake. Call me persnickety, but I hold steadfast to these rules. That said, there’s nothing wrong with eliminating excess fat in a homemade dish. But sacrificing flavor? Well, that’s just out of the question. 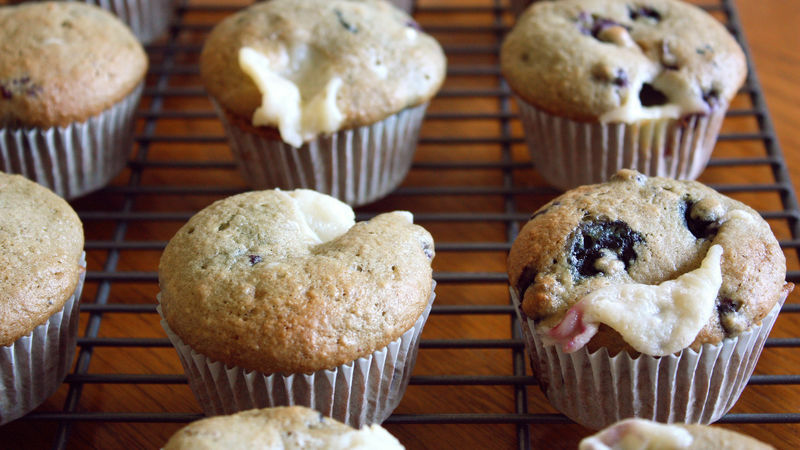 That’s why, when it comes to low-fat baked goods, these Low-Fat Blueberry Cream Cheese Muffins are at the top of my list. While there’s barely any fat in the muffin, the flavor is anything but compromised. Gooey, soft, sweet Neufchatel cheese is layered between bright, tart blueberry batter. The flavor combination is very similar to berries and cream, one of my favorite desserts (but not for everyday eating!). Straight from the oven, these muffins are to die for, but they won’t bust your belt. Truth be told though, this recipe is low in fat but it’s not the healthiest when it comes to sugar. So, if you don’t want all that sweetness, eliminate the powdered sugar in the cream cheese filling. You can even reduce the amount of granulated and brown sugar in the recipe, but I wouldn’t recommend it, as your muffins might start getting tough and chewy. And if you don’t like blueberries, you can swap them out for raspberries, blackberries or strawberries, or mix them all together for a very-berry muffin. These muffins are perfect to bring to your next brunch or for a quick and healthy weekend breakfast. Without excess fat in the recipe, the only thing you’ll have to worry about with these muffins is grabbing one before they’re all gone.